Born on 16 April 1894 in Lancashire, England - son of Joel and Elizabeth Ousman, Calgary, Alberta (later Montreal, Quebec) - at the time of his enlistment in 1915: trade as masher/mosher[? ]; single; no current or previous military service; Methodist; height of 5 feet 4 inches; chest of 34 inches fully expanded; fair complexion; grey eyes; dark brown hair. 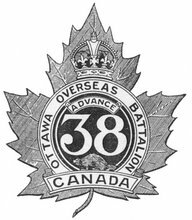 Joined the 56th Battalion, CEF, in Calgary, Alberta, on 12 May 1915 (number 446832) - taken on the strength of the 38th Battalion, CEF, in England on 3 or 4 July 1916 - landed in France with the 38th Battalion on 13 August 1916 - killed in action on 9 April 1917 - buried in Canadian Cemetery No.2 (Sp. Mem. No.23), France.